If you want to export the documents, files & folders from Office 365 SharePoint Online then Office 365 Document library Downloader is a best choice to make. It is possible to download and save selective data on your local PC with multiple other options to make the process more effective. Simply provide the Office 365 URL source from which data has to be downloaded. Users will be redirected to a login screen for Office 365 from where they can successfully proceed for downloading SharePoint Online documents to local PC. After logging into the Office 365 account; entire data is loaded on to the software. One can check on the boxes for respective folders, files, or documents to be downloaded. Selected data will get listed on the right side panel of the application with its file type defined. Users are given the opportunity to decide whether they want to overwrite existing file after being downloading or not. Along with that they also have the choice to maintain hierarchy of the folder structure. In addition to that, one can also set a maximum size limit in MB's for the files accordingly. File type filter option lets you decide if you want to include or exclude a specific document format from the data being downloaded. One can delimit the file formats using ";" sign like; .pdf; .jpg; etc. This way Office365 Document Downloader determines the user requirement successfully. One can also set a date range which will be used for determining which set of data has to be downloaded from Office 365 account to system partition. By providing a set of "From" and "To" date range, you can download only a selective group of data. An Error Log file is generated in which any of the errors encountered while downloading data from server are listed. Suppose, in case a file surfaced issues while being downloaded will be mentioned along with the cause of issue well-described in the Error Log. A clear preview of the data download progress can be taken by the users on commencing Office 365 move document to folder on partition procedure. This download progress will get updated instantly when the data gets downloaded one by one. Demo version of Office365 Document Downloader Software to save/export multiple Office 365 documents to file system lets you download data only up to 1 GB of file size as part of demonstration limitation. Can I store Office 365 documents locally using this SharePoint Online document library downloader? Yes, using this software you can export/download multiple documents from Office 365 SharePoint. How do I export selective file from Office 365 SharePoint using this tool? One can apply attribute, date type or file filters to selectively download multiple files from Office 365 SharePoint. Do I Need to Provide Office 365 Credentials to Login? Yes, MS Office 365 credential are required for saving office 365 documents locally. How will I get to know about the status of the download? Will I receive any export report to check the items which have been exported? Yes, an Error Log file is generated in which the errors encountered while saving Office 365 documents locally are listed. Can I bulk/batch export files from Office 365 SharePoint using this utility? 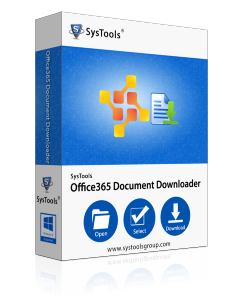 Yes, SysTools Office365 document downloader product allows the users to download multiple files from SharePoint Office 365 to local machine. There were so many documents on the Office365 account that I wasn't able to sort the ones I required. But the date range setting feature proved to be quite helpful in downloading selective range of data from Office365 with no flaws experienced in the process. Downloading all the documents from Server was a process I would never choose due the collection of a bulk number of documents. With the help of this software, I was able to selective document download on my local machine from the Office 365 account with any trouble. I have tried all the possible solutions for saving Office 365 documents locally but nothing worked as per my expectations. Then, I came across this application. I must say that SysTools Office 365 SharePoint document downloader is the best solution I can ever get! Thanks! I love the way this software program has made it easier for me to download multiple files from SharePoint Online to my local drive. Thanks to the development team of SysTools Office 365 document downloader. It's the best tool I have used.